1 Find A Grave, (accessed 12/27/2012). 2 New England Historical and Genealogical Register, (New England Historic and Genealogical Society), 1982, Vol. 136, p. 96. 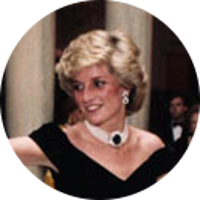 3 Evans, Richard K., The Ancestry of Diana, Princess of Wales , Boston: New England Historic Genealogical Society (2007), 7. 4 Kidd, Charles, Debrett Goes to Hollywood, New York: St. Martin's Press (1986), 122. 5 Roberts, Gary Boyd, The Royal Descents of 600 Immigrants to the American Colonies or the United States , Baltimore: Genealogical Publishing Co. (2008), 202, 578. 6 Roberts, Gary Boyd and William Addams Reitwiesner, American Ancestors and Cousins of The Princess of Wales, Baltimore: Genealogical Publishing Co., Inc. (1984), 24-25, Ancestry.com (Online Database). 7 Roberts, Gary Boyd, comp., Ancestors of American Presidents , Boston: New England Historic Genealogical Society (2009), 638. 8 Wikipedia, "Ruth Roche, Baroness Fermoy", (accessed 12/27/2012).